1) The fastest way to connect the Digital Central is through your home router. Connect your PC and your DC to the router, and check that your DC has DHCP field checked. 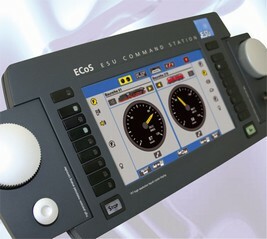 Choose auto search in the set-up for the Märklin or the ESU controller. Be a bit patient until the search finds the IP and connects automatically - showing green ready mode. 2) If done once GT-Command will connect automatically each time you start up, if the DC/ESU is truned on. This is a very nice feature - you see it in the main windows in the bottom. 3) You might have several locos and turnouts already on your DC/ESU. Do not edit them all again in GT-Command. Use "Game" and "Monitor", check "Log all Activities" and "Automatic Learning" , then you get all your units and locos automatically set up in GT-Command. You just need to select names and other explanations yourself. 4) Some time you can not find a lok or a unit. Address might be wrong or the controllers is running on a virtuel address. You get it into GT-command just driving it manually, and at the same time select "Game", and "Monitor". If you the look at the Monitor window you will see the lok with actual address listed under Who/What with an L in front. Now you can insert it automatically or manually in GT-Command in the Loco table and start calling on the loco. 5) Does the Mike function?, Check that the " Mik onl" field is green, may be press F2 some times, or if it is yellow say "Mike on" in the Michrophone. If it still does not work the Windows has not really connected the michrophone. You must go to control panel and make a set-up under sound.